What Happened: I was made aware through a random Facebook thread that riders were taking the cues for the first section of the event, normally handed out at the Pre-Race Meat-Up, and transferring the cues to their GPS devices for navigation by an audible cue instead of having to read the cues. This gave those who did that an advantage as they only had to listen for a sound and look down at their GPS for a direction and they did not have to do navigation as it was meant to be done- by the cue sheets and by observing the signs on the road. What The Change Is: Since only a few were doing this, it was an unfair advantage over the rest of the field. Also, it is expressly against the rules. So, as a result, cue sheets for the first part of Trans Iowa v14 will be handed out the morning of the event just before you are to take off. How This Affects The Pre-Race Meat-Up: First off- attendance to the Pre-Race Meat-Up is still mandatory! There will be no "morning of" registering or signing on. This would be too much of a burden for me and my volunteers, and there is no need for it. Plan on the Pre-Race Meat-Up to be pretty much as it was with a slight change to the end. (No cues to get and put in your GPS, for one thing!) Starts at 4:00pm Friday the 27th. With all that said, here is how the morning of the event is going to look. Be prepared or be disappointed! 3:30am- Riders should be at the starting area in front of Bikes To You by this time!! The address for Bikes To You Is 921 Broad St. If you are later than this you risk not getting cues for T.I.v14! 3:40am: Cues will begin to be distributed. Riders will be directed to line up in front of the start vehicle and will be directed through a line where volunteers will check your race number plate and check you off. No number plate visible? No cues! (This is one of the reasons why you HAVE to come to the Pre-Race Meat-Up) Another volunteer will hand you a cue sheet bag. The process of getting the riders corralled in front of the lead out vehicle will be accomplished by 3:40am. Then the line will proceed through the cue sheet hand-out process. 3:50am: CUE SHEET HAND OUT WILL CEASE. If you lolly-gag getting ready in the morning and arrive later than this, you won't be in T.I.v14. Volunteers will mark the last rider in line at 3:50 and anyone showing up afterward will be cut off. If you are out screwing around on your bike, tough. If you are messing about talking with folks and miss the cut off, too bad. You are big boys and girls, you can figure out how to pay attention and get down there on time. 3:55am: The cue sheet hand up process will put you at the back of the lead out vehicle. Guitar Ted will address you at this time briefly. 3:59am: Guitar Ted will call out "One minute to go! ", get into the lead out vehicle, and all riders should be set to go. 4:00am: The horn toots and we're off. Number Plate Protocol: Obviously, to expedite this we are going to require that your number plates be attached to the front of your bike, be VERY VISIBLE, and NOT MODIFIED IN ANY WAY! This means no "on the back" number plates, no side mounted number plates, and definitely no number plates which are crumpled, cut, or changed in any way. I realize that in years past I gave riders latitude in this area, but this new wrinkle, brought on by a cheater(s), necessitates that I be more rigid in terms of viewable number placement and where that number plate must be. This isn't anything new for many of you, because most mountain bike and other cycling events have restrictions on number plate placement these days. 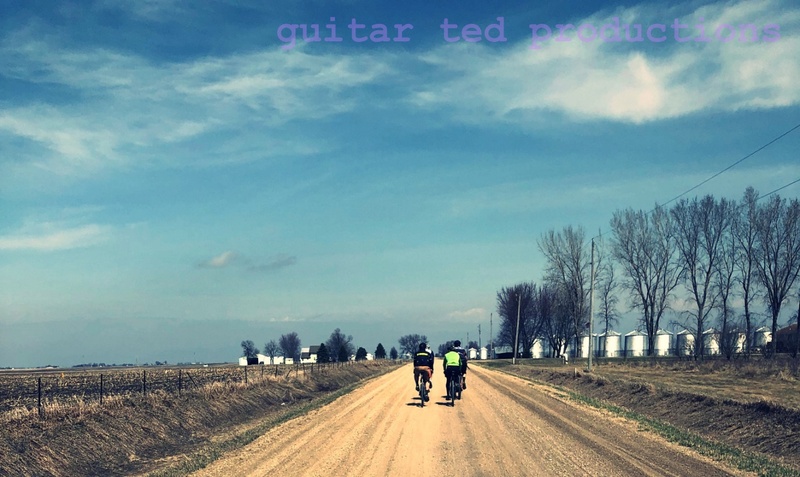 Please comply or risk getting DQ'ed by Guitar Ted. I'm in no mood to deal with rule benders, so don't even think about it! Your number plates will be handed out at the Pre-Race Meat Up. That way you have plenty of time to get them on your bike correctly. We will provide twisty ties, pins, and zip ties at the Pre-Race. Someone asked me a while back when they needed to be downtown at the start- when was the latest you could show up? What I am saying now is that the latest you can show up by is 3:30am. Because if you show up then (or before) you will be in no jeopardy of screwing up and missing the cue sheet hand out. Trust me, I am not going to be very open to people's cries for mercy on these points. It's going to be my way or the highway, and if you don't like that, don't show up at all. Really. I'm going to expedite the Pre-Race Meat-Up meeting notes and get you all out of there earlier than ever so you cannot say I am cutting into your beauty sleep. That means the meeting will start promptly at 7:00pm Friday and I expect to have you all out of there by 7:30pm. (NOTICE: Riders must be there at the Grinnell Steakhouse and signed on by 6:30pm or risk not getting into T.I.v14) So, don't come whining to me about making you get up a bit earlier. Besides, from what I've heard the last 13 years, most of you don't sleep much the night before anyway. Good Luck with the final preparations for the race! As a fellow curmudgeonly gravel race director I applaud your continued fight against people that want to hit the easy button.